Paperclay Ceramic Sculpture: personal thoughts and philosophy, sources of inspiration, techniques. 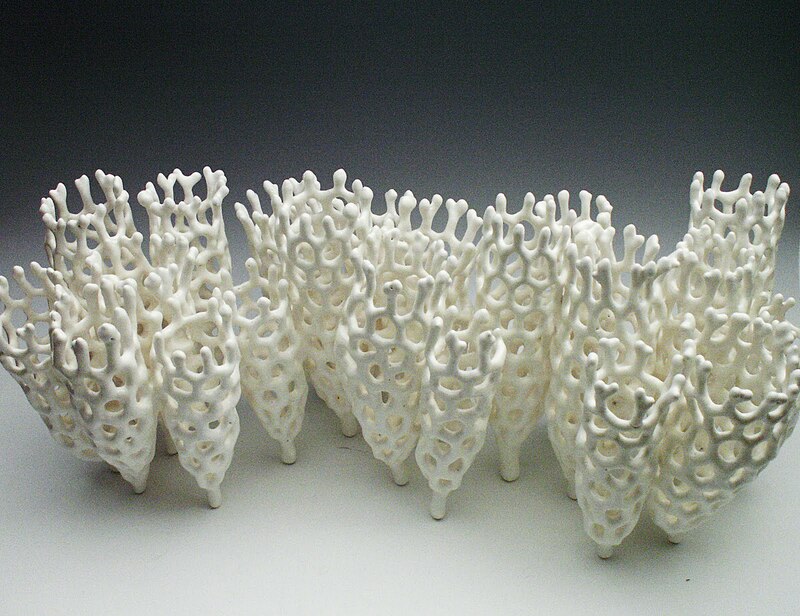 I'm happy and excited to announce my piece "Colony" has been accepted into this year's Ink and Clay 38 exhibition at the Kellogg Art Gallery at the Cal Poly Pomona campus. Saturday, March 24, 2012 from 5:00PM to 7:00PM. Light refreshments and drinks are served. Admission is free. This piece, composing of three separate units or modules can be arranged in different configurations, each giving a different feel to the piece. 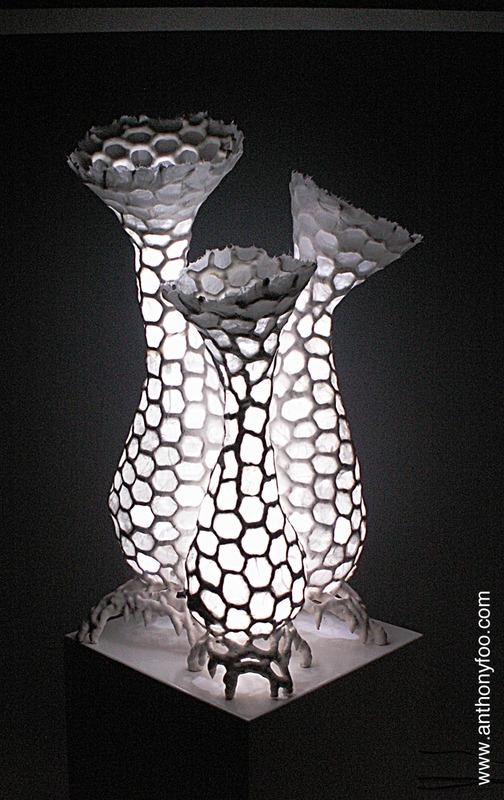 In 2011, I did quite bit of R&D with paper clay and steel wire mesh. This was one of several completed works in this series. 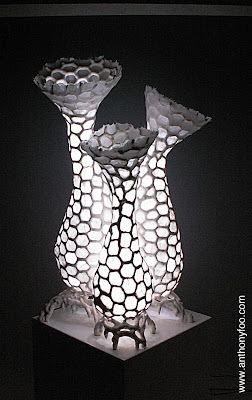 The clay is Southern Ice Porcelain paper clay over steel mesh (also called chicken wire), and fired to Cone 06. I didn't use any glaze since I greatly enjoy the brilliant whiteness of the porcelain paper clay. A clear sealant was used to protect the surface of the bisqued work. In this arrangement, the piece is 38" W x 16"D x 13"H.
This piece received the 2nd prize in the City of Brea "Made in California" All Media 2011 show. I enjoyed making the piece and was glad it was so well received. My newest set of 3 Japanese themed masks on my work bench. Bone dry and ready for bisque firing. All 3 started from the generic mask "blanks" on the left. I made several of them so I have a supply ready to go when I need them. The demon mask on the far right has a tongue that wiggles! The mask in the middle is my version of Karura, from Japanese Hindu-Buddhist mythology. It has a human body and the face or beak of an eagle. 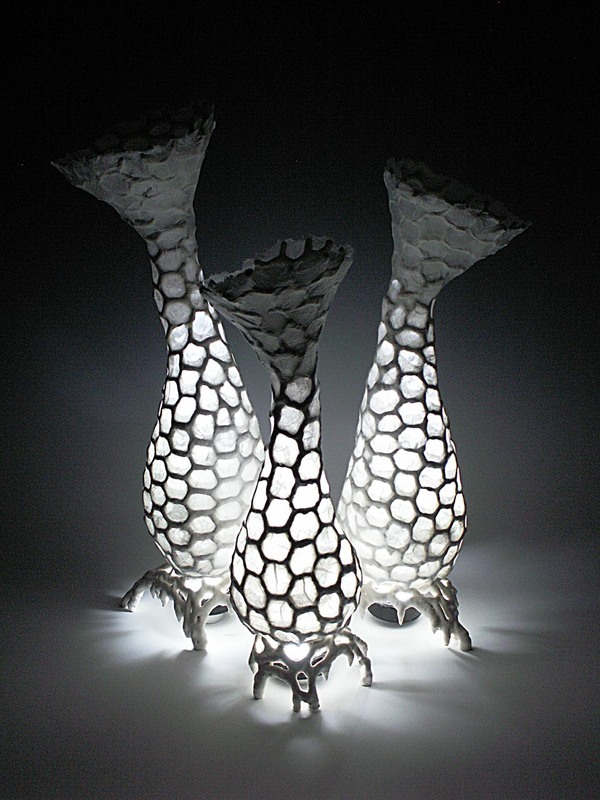 I'm going to use the same clear crackle raku glaze on these pieces like I've done before. Hopefully, they'll come out as nice as my first batch. Will post them when I have them completed. 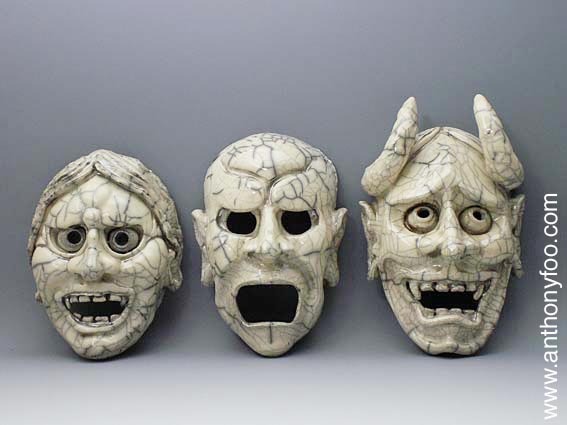 These 3 masks were featured in the 500 Raku book by Lark Crafts. The construction method was described in an earlier post. 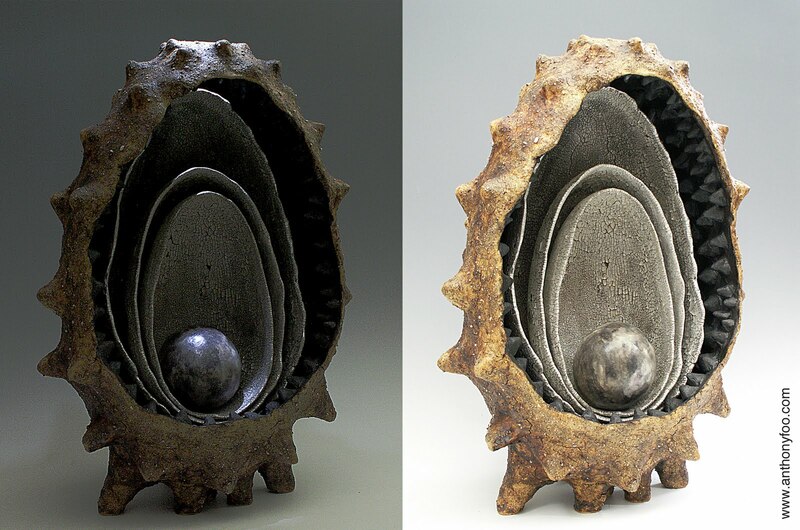 A clear Raku crackle glaze was used. This is the link to my website with a little story behind them. 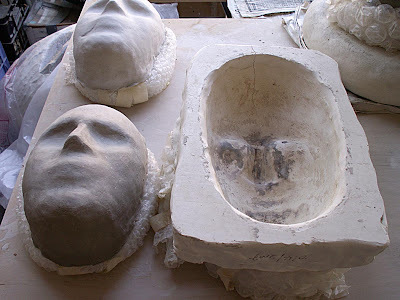 My preferred way of making masks is to make a bunch of these generic masks from a master mold, let them dry completely and then alter them. This way, I can store these bone dry "mask-forms" indefinitely until I get the inspiration or motivation to work on them. The picture on the right shows the plaster mold. Fresh paper clay mask are on the left. Facial features can easily be changed, modified or even removed. At this point, I usually work by adding wet paper clay to the bone dry base, building up layer upon layer. If a jaw line needs to be drastically altered, I use a dry wall saw to effect such a major change. The bone dry form can also be wetted down to reconstitute the plasticity of moist paper clay so that contours can be reshaped. I'm working on a new set of 3 Japanese masks. I'll post them soon. Here's more info about the upcoming Laguna Art Museum Art Auction 2012. Click on this link. I'm excited to be a part of this event and to help in the arts especially in these times when everyone is cutting back on art programs and funding. I'm in the Participating Artist list. Here's the direct link to my contributed piece. Come support the Arts, view and bid on some great art works and meet the artists up close. See you there! I think as artists we have a vision of what our final piece will look like. For me, it's a matter of how close my final work comes to what I had in mind when I first start a project. Sometimes, the end result far exceeds the first impression and other times, not. This was my vision for this piece, "Good Morning." I wanted to have some kind of lighting within the piece. Searching the web, I found these mini battery operated LED lights that I thought would work and after installing them in my pieces, they lit up my pieces really nice. I'm happy with the result and have added another "tool" in my toolbox of new experiences. Does this change this from being a fine art to an utilitarian object? I like it the end result. It's cool and that's what matters! Laguna Art Museum in Laguna Beach, California is having its annual fund raiser this February. Here is the link on Facebook for more information. Come support the arts! I encourage local artists and non-artists like to attend this evening of fun and activities. You'll get to see and bid on a wide range of affordable art pieces contributed by invited artists. You'll get to see my piece up close and even bid on it. Getting to meet me and talk with me is an added bonus. This is my contribution to the fund raiser. 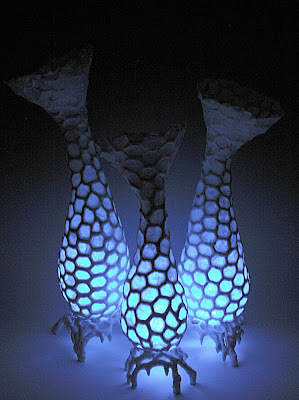 This time, I used puck LED lights underneath each of the pods. It gives me some kind of idea what the lighting would be like with a stronger and brighter light source. 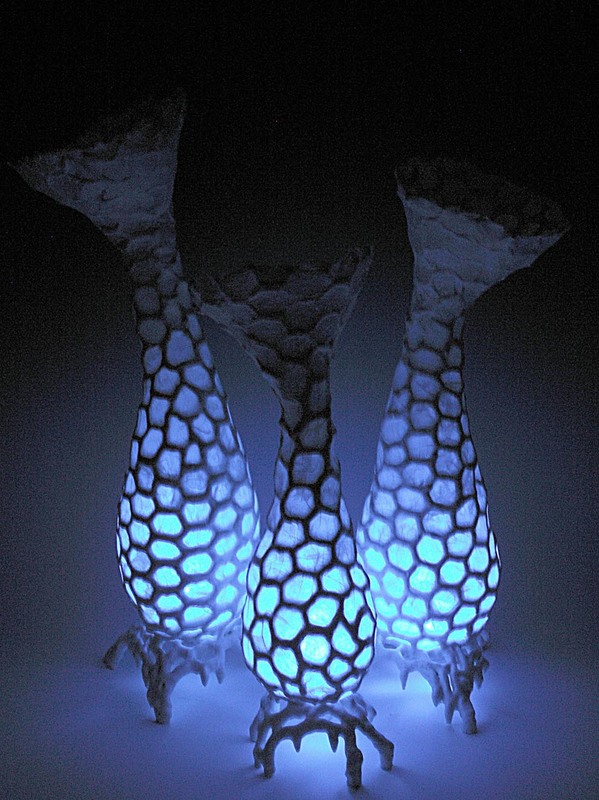 The question is how to make the light source self-contained, if that is even possible. I completed this piece, "Good Morning," and thought it would benefit from some kind of lighting within the individual pods. The problem was trying to come up with some kind of decent, reliable and not too cumbersome electrical system for the lights. The left image was my original concept for this piece. I wanted a beam of light shining down into the central aperture and illuminating the contents of the pod. I took this picture with intentionally low light to illustrate the concept. In a well lit gallery, a much stronger light will be needed. I think it's really nice to have the edges of the internal pods catch the light. Aardvark Clay, Santa Ana, CA.